A State-of-the-Art Building for A State-of-the-Art Industry The Nanoscale Material Science and Engineering Building is an exciting addition to campus with many innovative characteristics. 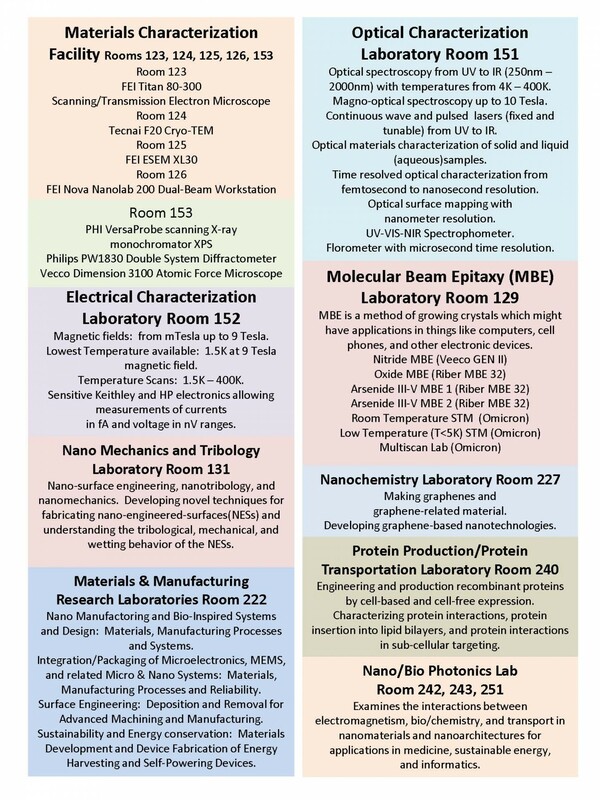 Because of the atomic-level research that takes place in the building, its rooms were built with the needed specifications to support nanoscale research. Rooms with sensitive instruments have vibration isolation to prevent interference. Other rooms have electromagnetic wave isolation, so that even seemingly innocent devices such as cell phones cannot penetrate the space. Still other rooms have ultra-sensitive temperature control. The building also houses a class 100 cleanroom, a room where the air is so efficiently filtered that fewer than 100 particles of dust a millionth of a meter in diameter or larger can be found in any cubic foot of air over a minute. The instrumentation facilities are designed to provide innovative tools and corresponding training to investigators throughout the state on cutting-edge analytical instruments. This work will facilitate research and education at the frontiers of science and engineering. The facility has 20 different instruments, some of them world-class, available to campus faculty and students and to industries in Arkansas and the surrounding area. In addition to these advanced analytical instruments, the building houses an innovative approach to graduate education, consisting of three different rooms. The discovery room, surrounded by writable walls, brings students together from different disciplines to throw ideas into the community for the vigorous types of discussions that assure both rapid concept evolution and survival of only the fittest ideas. This atmosphere is aided by computation and design tools focused at the nanoscale, with communication enhancements such as electronic whiteboards, teleconferencing capabilities and wireless connectivity to large-screen computer displays. Once students have a well-developed idea, a small team transfers the idea to the launch room. This area is designed for detailed strategic discussions as the students map out a combined technology and business plan to fabricate a new nanoscale material or structure that meets the needs of a particular Arkansas industry or small business. As that plan matures, the effort will transition to the proof-of-concept room for nanostructure fabrication. This is a flexible lab with fabrication and testing tools that allow students to create a product and test its performance. Equipment in this room is moved in and out depending on the product under evaluation. This workspace prepares students for the demands of todaypanies, where creating better products is an everyday expectation. These three rooms create a more like the research and development division of a company rather than a classroom. With a state-of-the-art facility and a novel approach to graduate education, the new building will help the University of Arkansas satisfy the needs of the nanotechnology industry for foreseeable future.